This just in from Nancy - secretary of the Leabank Square Community Association. She needs as many volunteers as possible to help out doing a door-to-door survey about some issues in our lovely square. Please get back to her on leabanksquareca@qmail.com with your kind offers of support - and help find out what we all feel about living here. 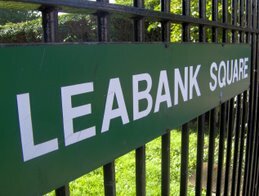 The LSCA are going to be conducting a door to door survey in the next few weeks to ask everyone on the Square for their ideas and feelings about living in Leabank. Please let us know if you have any ideas about other things we should include and also if you would can help us do the survey; talking to your neighbours and getting their feedback etc. I'm sure many of us will remember Erin & Mat from the Hackney Wick Festival. They had that amazing handmade fabric jewellery stall that we were all drooling over!! Well - now's your chance to check them out again - or you can even hire a stall alongside them as well! Stalls cost a mere £10 - and because there will be many other amazing stall holders there - the punters will come flooding in - getting their Xmas shopping in nice & early. This incredible market will be on every last Saturday of each month - starting October 30th - from 11am to 5pm. So come on Leabank Square - whether you want to set up stall - or simply browse yourself sill in a great pub - hop on the number 388 & get yourself down there!! Scrap Metal Thieves Strike Again!!! Last Friday - a white van with a couple of guys in fluorescents - drove into Leabank Square - and lifted the metal sewer lids - popped them into the back of the van - and drove off. They were so quick- that when Tony saw them through his window - by the time he got down to ask them who they were - they'd driven off. These guys have definitely done this a few times before. They might even be the same bunch who got our garden tools last summer!! Sometimes they are the same white vans who are doing the fly-tipping. They arrive with builders rubble - dump it - and then load up 'scrap' metal. A big thank you to Family Mosaic for screwing wooden covers over the holes so promptly - but the first dump truck that parks on top of it - they'll be trapped in a hole. Please always ask any white van men - just who they are, what they are doing & who gave them permission to do it. If possible - try & get a few pics on your camera - and pass them on to us or our Local Neighbourhood Team. Purple Crocus Planting in Beautiful Sunshine! Thanks to everyone who turned out to plant the purple crocus path today! In no time at all we planted all the 300 Ruby Giant Crocus bulbs kindly donated by the Eden Project & Rotary International. The reason for the colour purple - is that it is the same colour of the dye that kids in the developing world have to dip their fingers in after Polio inoculation. This stays on their fingertips for a couple of months - enabling health workers to identify which children still to immunise. The beauty of these bulbs is that they will come up year after year - making the path along the fence look stunning every spring. And - of course - it just happens to be Leabank Purple as well! Besides the stunning autumn sunshine today - always the best thing about the Leabank Square Gardening Club - is the great friendships struck between neighbours. Thanks everyone! Take a look at the fantastic Open Day we had for residents up in the Purple Garden. The weather was nowhere near the typhoon predicted - and some of us even got sunburned! Thanks to everyone for the delicious food for lunch - we've never had such scrummy food up there!! And then there was the amazing production of the seed bombs!!! Wow!! Thanks to Andreas's amazing Seed Press - we made hundreds of beautiful seed bombs. Yes - we do mean beautiful!! I know we've made rolled up bombs in the past - but these are class!! Thanks again to everyone for making it such a lovely day.